For those who haven’t come across it, Steve Mann runs a very informative site on Yorkshire chess and beyond at the following link. The 400 league season ended with Hillsborough and Nomads on the same points, both managing seven wins and one loss. 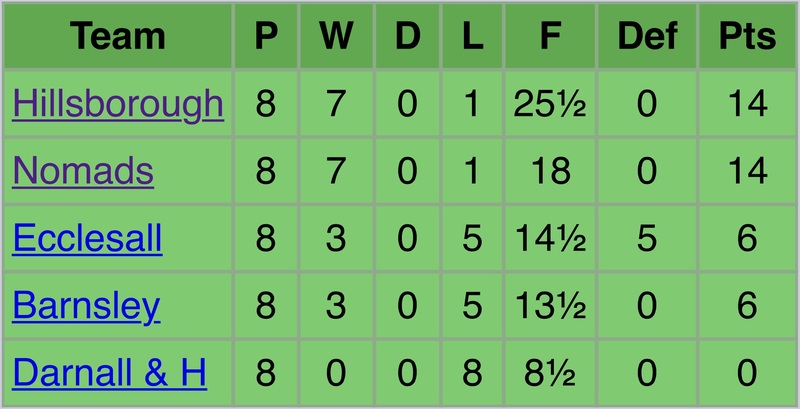 Hillsborough had the higher game points but they didn’t count, it was play off time! We reconvened at The New Barrack Tavern On Monday 11th June. We had an early blow when Sam had to pull out at late notice, meaning we went into the match with only three players and were 1-0 down before we began. Well before 8.30pm, Eric wrapped up a good win to bring us back on level terms, leaving Les & I to play on, Les’s game was fairly level, I was a piece and a pawn up. It was another hour or so later when Les secured the win to take us 2-1 up meaning I hopefully only had to play the game through without any blunders to secure a victory. Victory eventually came and we won 3-1.